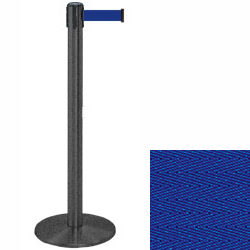 This black stanchion w/blue retractable belt offers high contrast between the wrinkle finish pole and the brightly colored 7.5' long fabric barrier. 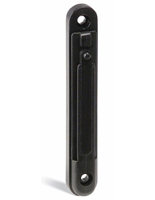 The eye-catching crowd control accessory is a modern alternative to classic post-and-rope configurations. 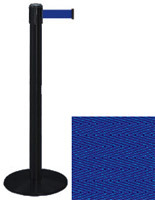 Each 38" tall stanchion w/blue retractable belt features an ABS cartridge that retracts the barrier when not in use. This type of modular crowd control fixture is designed for use with multiple line posts and can be configured to match any queueing need. 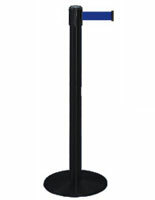 This versatile 38" tall stanchion w/blue retractable belt is easily moved and stored, the the base and retracted barrier requiring less space than standard rope configurations. 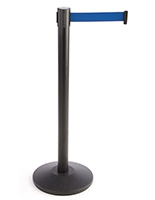 Each sturdy pole has a 13.5" diameter round base that provides stability in even the busiest public areas.